Grand Central Publishing, 9781455512348, 384pp. There's nothing more mysterious than a locked box. Whether it's a literal strongbox, an empty coffin, the inner workings of a scientist's mind, or an underground prison cell, there are those who will use any means necessary to unlock the secrets of...THE MYSTERY BOX. 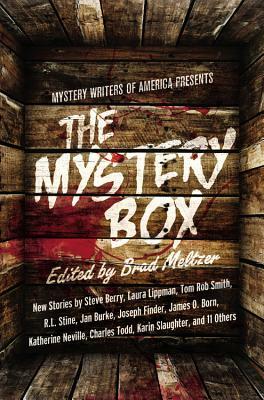 With this anthology, bestselling author Brad Meltzer introduces twenty-one original stories from today's most prominent mystery writers. In Laura Lippman's "Waco 1982," a young reporter stuck with a seemingly mundane assignment on lost-and-found boxes unwittingly discovers a dark crime. In Joseph Finder's "Heirloom," a scheming neighbor frightens the new couple on the block with an unnerving tale of buried treasure. In R.L. Stine's "High Stakes," a man on his honeymoon gets drawn into a bizarre bet involving a coffin--a bet he may pay for with his life. From the foothills of Mount Fuji to Georgia's Okefenokee Swamp, from a physics laboratory in wartime Leipzig to an unusual fitness club in Boca Raton, these sometimes terrifying, sometimes funny, and always suspenseful tales will keep you riveted to the page.